Model-Gadgets has developed a range of memory modules for use with all Futaba transmitters with CAMPac expansion capability. Our UltraPAC is unique; it is the first and only alternative to a 64K Futaba CAMPac. 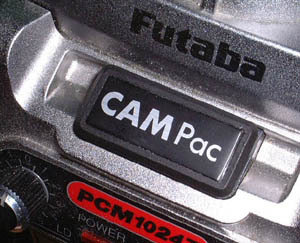 Yet our new UltraPAC-II, not only has up to eight times the capacity of a standard CAMPac, but also has the ability to activate the secret service menu of your Futaba radio. 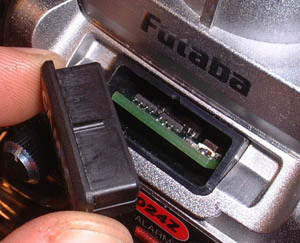 Thus you can now obtain access to settings formerly known only by Futaba service technicians. Among other functions, you can fully re-calibrate you 9Z radio after you DIY replace the backup battery, a full reset or just to make sure that everything works as it should do. FULLY compatible with all Futaba transmitters which support the CAMPac memory expansion. Integrated service menu enabler. The UltraPAC acts as the electronic key required to gain access your transmitter’s secret service menu. Integrated memory bank erase feature gives you a fresh start when needed. New Push-button/LED memory bank switching mechanism that does not require removal of the module from the transmitter. Individual write protection for each memory bank. Upgradeable firmware allows more features to be added as they become available. We are happy to hear your ideas. Fits perfectly under the plastic dust cap covering the memory slot. 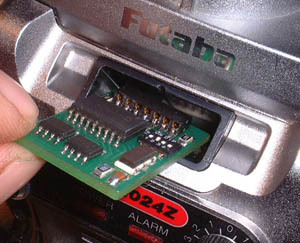 No modifications required and your radio will not look any different! Fits perfectly inside the case of an original CAMPac if you have one. Factory assembled with state-of-the-art surface-mount components and gold plated connectors for increased reliability. Industrial rating components ensure operation of the UltraPAC even at temperatures below freezing. Optional connection to a PC (see freeware CMS by Wallace Louie and ToolPac by Roman Kolbábek) allows backing up of your model settings! Now you can store your model settings on a floppy or hard disk, and you can email them to anyone with an email address! * Protocol extensions allow increased functionality of the UltraPAC when it is connected with a personal computer. Their main role is to allow compatible computer software to switch banks automatically and thus it makes it possible to perform read and write operations to various memory banks without having to manually switch between them. The write protect state of each memory bank and the UltraPAC’s firmware version can also be read. ** Often you don't get as much model program storage out of a 64K CAMPac as you might think. Page 12 of the 9Z user manual explains how the 9Z manages the CAMPac's memory. Briefly, a 64K CAMPac adds 16 models on the list. However depending on how complex each model program is you may not be able to use all 16 of them. A typical helicopter program requires four flight conditions (Normal, Idle-1, Idle-2, Hold) and thus according to the table on page 12 of the 9Z manual only 5 such models can be stored in a 64K CAMPac. An expanded version of this table can be found below showing the storage capabilities of various UltraPACs in comparison to a 64K CAMPac. Tip: Often there is a number of unused flight conditions linked with your model programs. Although unused, these flight conditions still occupy memory space. Unlinking them will allow you to store more models in your CAMPac/UltraPAC. *** The 512K UltraPAC-II is the only storage medium that can fully backup your 9Z no matter how complex your model programs are. Not only that, but there is space left to add six more model programs with 8 flight conditions each! The memory is divided in 64K memory blocks (banks) with individual write protect capability. This feature greatly assists in keeping safe backups of model programs on some banks, while using other banks to expand your transmitter’s memory. However, nothing restricts the use of all banks for backing up purposes or normal operation. The operation of the UltraPAC is controlled by the use of a miniature pushbutton and user feedback is available from a LED (light emitting diode). The same LED confirms the successful completion of tasks such as self-test and memory integrity test. Each memory bank is individually accessible. Thus -if required- you may initialize and use each bank with different types of transmitters. For example Bank1 may be used with an 8U, Bank2 with a 9C, Bank3 with a 9Z transmitter, etc. Any combination is possible. 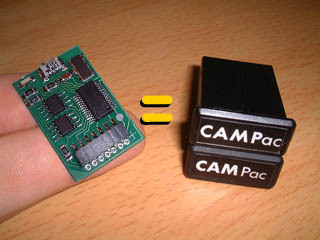 The UltraPAC is small enough to fit inside the CAMPac compartment. The existing factory dust cap fits back over the UltraPAC once it is installed (no modifications required). Your radio will not look any different! 1. We keep our distribution line short. With less people involved there is adequate profit for all while the product still reaches the consumer at a sensible price. 2. The UltraPAC was designed as a part time effort. To date it has taken more than 200 hours to achieve a working prototype, more than 300 until is reached a marketable quality and possibly over 400 hours until the latest model is released. If this time was paid it would have resulted in substantial R&D costs which would have to be reflected to the price. 3. There is not a great price difference between 64K memory chips and larger capacities. Thus for a small manufacturing cost difference we offer a more competitive product and benefit the consumer. 4. Finally the integrated service menu enabler (SME) is a bonus. Since the UltraPAC's microcontroller is capable of undertaking this task too without any additional electronic components, there are no extra manufacturing costs involved with the addition of this feature. We have simply devoted the development time to integrate this feature within the UltraPAC’s firmware. 1. The larger amount of memory offered by the UltraPAC clearly shows that we did not try to cut any costs. In fact all components used for the UltraPAC are of industrial rating and able to work even in temperatures below freezing. 2. The PCB manufacture and component assembly has been undertaken by companies with years of experience in their fields. 3. Every single unit is individually tested before dispatch. We never had an UltraPAC returned for service or replacement. 4. We offer 12 months warranty and sensible service costs thereafter. In most cases we will only charge the actual cost of parts and return postage. Discounted price will be offered for a replacement UltraPAC if yours is physically damaged or beyond economical repair.